OS X has an easy way to add keyboard shortcuts: in System Preferences.app go to the “Keyboard” preference pane, click on “Shortcuts” and then “App Shortcuts”. You can create a “global” keyboard shortcut (which will work in any application which has a matching menu item), or you can create an app specific shortcut which will only work in one particular application. That’s great, but what happens if an application has two menu items with the same name? How can you tell which menu item will be used for the keyboard shortcut? Turns out there’s an easy way to do this, but one that I had never heard of, and I’m guessing others might not have known it either. 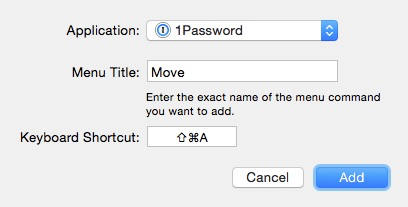 I’m going to use 1Password as an example, but this will work in any OS X app. I have been using 1Password’s “Vaults” feature and created two vaults: one called “Archive” for things I don’t use all that often, and another called “Mom” for passwords, etc. that I keep for my mom. But the problem with that is obvious: Does “Move” refer to Item » Share » Mom » Move or to Item » Share » Archive » Move? Jamie Phelps linked to this tip on the awesome-but-sadly-now-defunct “Mac OS X Hints” site which explains that you can specify the exact menu item by using a -> to indicate the exact menu item that you mean. Do you use the “Save as PDF…” feature in the standard OS X print menu? I bet many people don't even know it exists, but it’s a really handy feature, and it gets even better if you use the great “Save as PDF…” tip from David Sparks. He even made a screencast to show you how to do it. Tj went to college as a Computer Science major and came out as a Presbyterian pastor. It’s kind of a long story. He’s been using OS X since the days of NeXTStep. These days he enjoys finding ways to automate his Mac with Keyboard Maestro, Hazel, launchd, and/or shell scripts. Brett Terpstra once called him insane (but in a good way). He believes in keeping his dock on the left side, multiple backups, and the Oxford comma. When he’s not writing at MacStories, you can find him at Luo.ma.